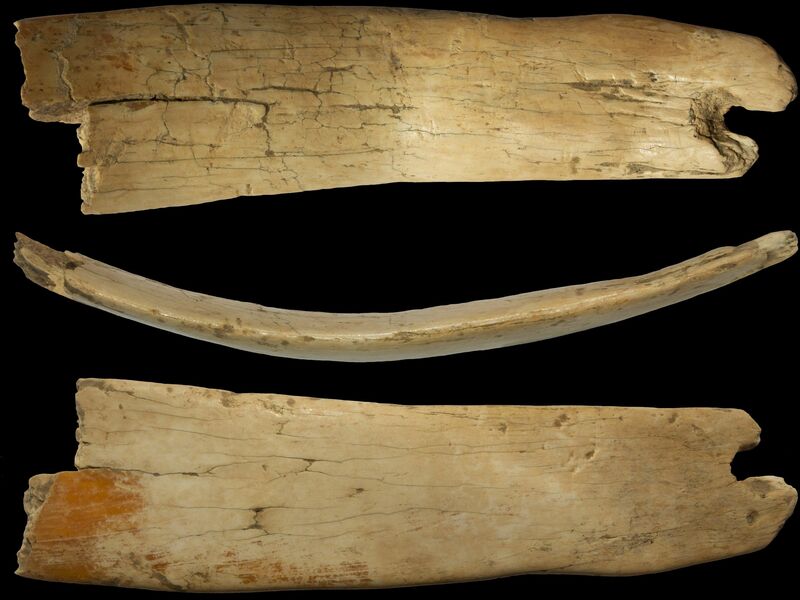 Researchers have discovered pieces of a 50,000-year-old headband made of mammoth ivory in the Denisova Cave in the Altai Mountains of southwestern Siberia. Curved and pierced at the sides, the wide band of ivory was worn tied around the head. Only one of the two fragments found thus far still has the hole the tie was corded through. The wear and tear indicates the headband was used thoroughly before being discarded at the site, not broken in manufacture. 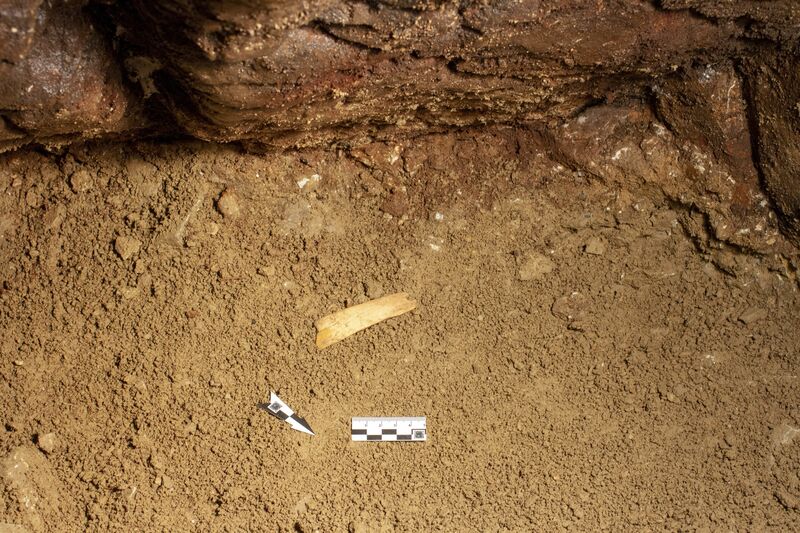 Named after a hermit who inhabited the cave in the 19th century, this is the type site for Denisovan hominids, the place where in 2008 the finger bone of a juvenile female was found that had neither Neanderthal nor modern human DNA. Osteological remains of Neanderthal and Denisovan people have been found there, as have artifacts and tools used by early modern humans. It is the only site known to have been occupied concurrently by Neanderthals, Denisovans and modern humans. The Novosibirsk Institute of Archeology and Ethnography has a permanent camp in this uniquely important paleontological motherlode. Past excavations have unearthed numerous mammoth ivory artifacts — beads, rings, bracelets, arrowheads, pendants, a sewing needle so well-crafted it can still be used today — but this is the first diadem. The ivory itself is 50,000 years old. Ivory can be crafted for years after the mammoth’s death, however, so the headband has been tentatively dated to between 45,000 and 50,000 years old. To narrow down the date of its manufacture and use, researchers will radiocarbon date other organic remains found in the headpiece’s archaeological layer. They will also attempt a more precise technology called optical dating which determines when a layer was at the surface by analyzing its photons. Even with the ballpark dating, the diadem is far and away the oldest of its kind known. 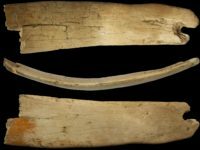 Other mammoth ivory headbands have been discovered at Paleolithic sites in northern and eastern Siberia. Some are more elaborately designed with decorations carved on the ivory. Dates on those pieces range from 20,000 to 28,000 years ago. This headband isn’t decorated and there’s no evidence it held any specific symbolic meaning. Its size indicates it was worn by a man, one with an impressive noggin, and researchers think it was a practical object, a means to keep the fellow’s hair out of his eyes. [Novosibirsk Institute of Archeology and Ethnography researcher Alexander Fedorchenko] explained that some 50,000 years after it was made, it fitted his own temple and the back of his head. Its diameter could have changed with years due to gradual straightening of the curved part, he said. ‘Mammoth ivory plates were first thoroughly soaked in water to become more ductile and not crack during processing, and then they were bent under a right angle,’ he said. ‘Any bent object tends to return to their original shape over time. The tiara is a gift for trace evidence experts as it shows all possible ways of processing mammoth ivory used by ancient men from the Denisova Cave, like whittling, soaking in water, bending, grinding, polishing and drilling. ‘These are all possible technologies from A to Z typically used in the Paleolithic time, but which are usually associated with activities of Homo sapiens. 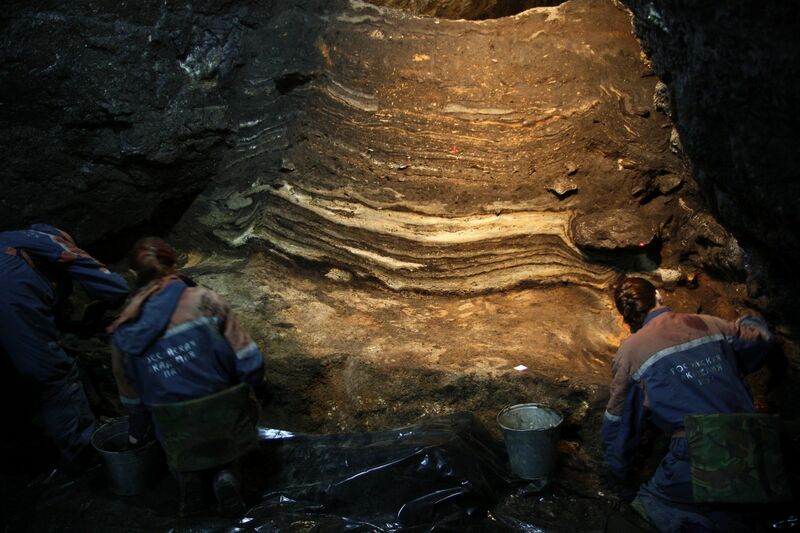 ‘Here we likely deal with another, more ancient culture, because there was not a single piece of bone belonging to a Homo sapiens found in the cave’, said Fedorchenko. The team is hopeful that more fragments of the headband will be found as excavations continue. Ivory is durable and inedible. If there’s more of it to be discovered, chances are good that it will be.